On Sunday the 17th. 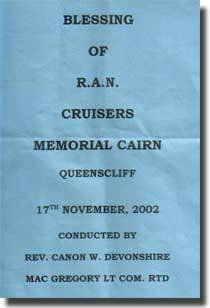 of November 2002 we had the Blessing of the Royal Australian Navy Cruisers Memorial Cairn at Queenscliff, Victoria. The ceremony was conducted by Reverend Canon W. Devonshire with me, as President of HMAS Canberra/HMAS Shropshire Association here in Victoria reading the inscriptions on the brass plaque detailing the service of the seven cruisers during WW2, HMA Ships, Australia, Canberra, Shropshire, all 8 inch gunned heavy cruisers, and Adelaide, Hobart. Perth, and Sydney, all 6 inch gunned light cruisers. To conclude the ceremony, I laid a wreath at the base of this new blue stoned cairn, topped with a black marble slab, to which is fixed the brass plaque, edged with a brass rope border. Several hundred people attended, including some 30 members of our Canberra/ Shropshire Association. To commence proceedings, a group from the RAN Minesweepers Association, a group from HMAS Hobart Association, a group from HMAS Warramunga Association, and my Shropshire group, all marched behind their ship's banners, supported by the Geelong Memorial Band leading the marchers, and we were led by Commodore Jim Dickson, AM, MBE, RAN, R'td. At the conclusion of a moving ceremony, luncheon was served at the local Returned Services Club of Queenscliff. 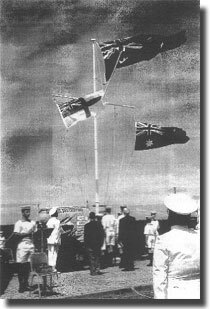 Flagpole at the site of RAN Cruisers Memorial Cairn at Queenscliff.